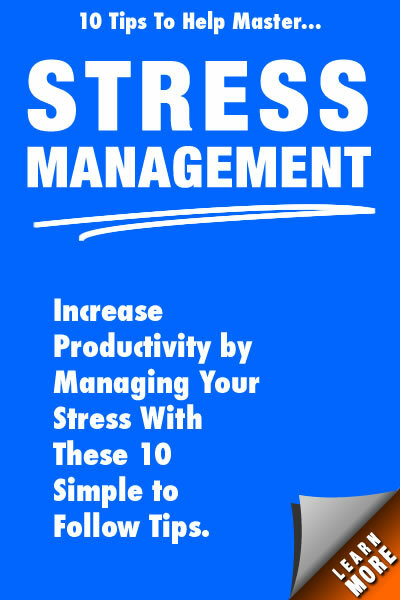 Many people are experiencing increased levels of daily stress and eating healthy foods is often recommended as an effective remedy. News articles are constantly updating us on the importance of good nutrition. With so little time, busy parents sometimes opt for using a fast food drive thru window to provide dinner. Planning healthy menus takes precious time, and grocery shopping can be a challenge. Also, it’s difficult to know exactly which ingredients in the store-bought foods offer the best nutrition. 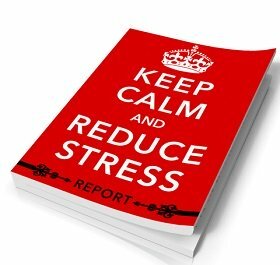 Headlines often publicize the public’s concerns about increased levels of stress and eating healthy. Do you find that grocery shopping increases your stress and eating healthy goals seem to be unattainable? We thought that reviewing how to read the Nutrition Labels included on all processed US food products might be helpful. We know that you want to provide your families with nutritious food without having harmful chemicals. In this article we simplify how to read the nutrition information so you can make more informed decisions about what foods to buy. Starting in 1994, the FDA and U.S. Department of Agriculture required both the ingredients and nutritional information to be provided along with a food label of a standard size and shape, labeled, Nutrition Facts. This label describes serving size, calories, and nutrition information for the specific product. The enclosed graph shows what this standard label looks like. The first item on the label identifies the standardized measurement for the meal or snack portion in a unit such as cups or pieces, followed by the metric amount (i.e., number of grams the food contains). The number of calories & calories from fat. Calories provide a measure of how much energy you get from a serving of the identified food. Consider the serving size as it compares to the amount of calories consumed. Identify the number of calories that are from the fat content. If there are 200 calories per serving and 100 of the calories come from fat, then 50% of the calories in a single serving come from fat. The Heart Association recommends a diet having less than 30% of fat calories to total calories. The nutritional value of this food product. The nutrients listed first on the label are the ones Americans generally eat in adequate amounts. Be careful not to consume too much of the total fat, cholesterol, and sodium nutrients. Health experts recommend that you keep your intake of saturated fat, trans-fat, and cholesterol as low as possible as part of a nutritionally balanced diet. 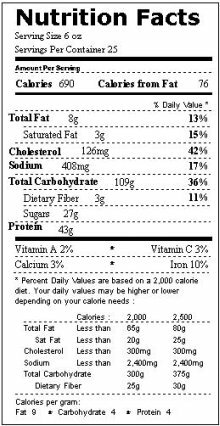 There is a footnote on the bottom of the Nutrition Facts Label. It is the same on every label. The footnote contains the Daily Values (DVs) for 2,000- and 2,500-calorie diets and has been determined based on public health experts’ advice. The percentages listed of the fat, cholesterol, sodium, and carbohydrates identify recommended amounts that you should not exceed in your diet. When looking at food labels, you also need to review the ingredients listed. Ingredients are listed in descending order of predominance. The first ingredient has the highest content in the product, and the last ingredient has the least amount in the product. You can enjoy lower levels of stress and eating healthy by choosing products that list sugars and salts at the end of the ingredient list. Stress and eating healthy do not have to be burdens to overcome as you prepare family meals. A little planning and reading labels can turn you into a wise consumer and allow you to develop lifestyle habits that benefit your family members’ good health. Health experts have long advised that reducing levels of stress and eating healthy, along with regular exercise, provide a more vibrant and healthy lifestyle. Hopefully, reading nutrition labels is a good start to helping your family enjoy more nutritious and healthy meals without making the purchasing of food more complicated. Happy shopping.